Whose Video Is Wizkid Referring To As Smellos? Sesan who has had a terrible week since the Davido's Skelewu video dropped few days ago calling it a leak and unofficial video that is way below standard. 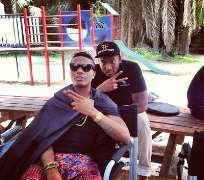 Sesan has directed Wizkid's Jaiye Jaiye soon to hit your screen. Wizkid hailed Sesan on a job well done on his hit single Jaiye Jaiye directed by Sesan.